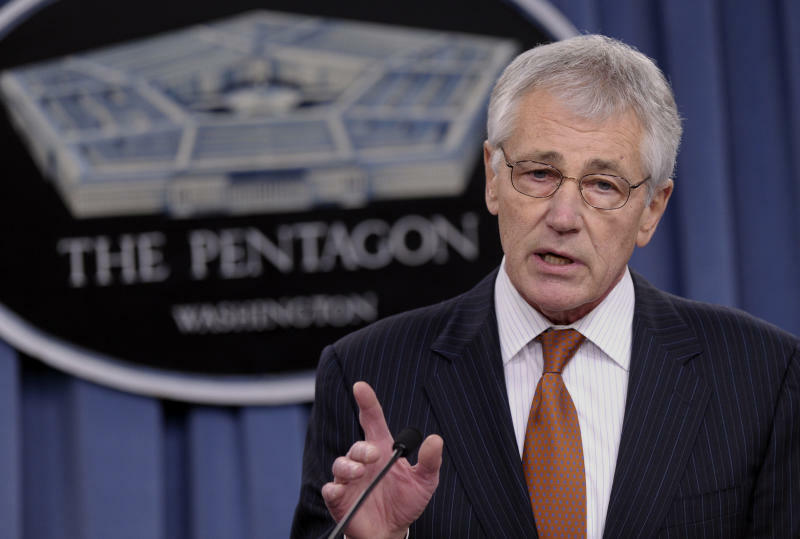 WASHINGTON (AP) -- Pentagon chief Chuck Hagel is recommending shrinking the Army to its smallest size since the buildup to U.S. involvement in World War II in an effort to balance postwar defense needs with budget realities, defense officials said Monday. Hagel is expected to announce that and other recommendations Monday in a speech at the Pentagon outlining his priorities for next year's defense budget. Army leaders have been saying for months that they expect their size would shrink as the nation prepares to end its combat role in Afghanistan this year. The Army, which is the largest of the armed services, currently has 522,000 active-duty soldiers and is scheduled to shrink to 490,000 by 2015 from a wartime peak of 570,000. Hagel is expected to propose cutting it further to between 440,000 and 450,000. Earlier this month, Gen. Ray Odierno, Army chief of staff, told an audience at the Council on Foreign Relations that an army of 420,000 would be too small for a world that has such an uncertain national security landscape. The minimum size, he said, would be about 450,000. He said shrinking to 420,000 would make a big difference in the capabilities of the force. "I'm on the record saying, as a minimum, I think our end strength needs to be around 450,000; 330,000 in the active, 335,000 in the Guard, and about 195,000 in the U.S. Army Reserve. And then we would be able to do it — at higher risk, but we should be able to do it," he said. Odierno has also said that whatever the future size of the Army, it must adapt to conditions that are different from what many soldiers have become accustomed to during more than a decade of war. He said many have the misperception that the Army is no longer busy.